December 3, 2017 at 12:09a.m. Sometimes, Santa wears a badge and rolls in a police cruiser. 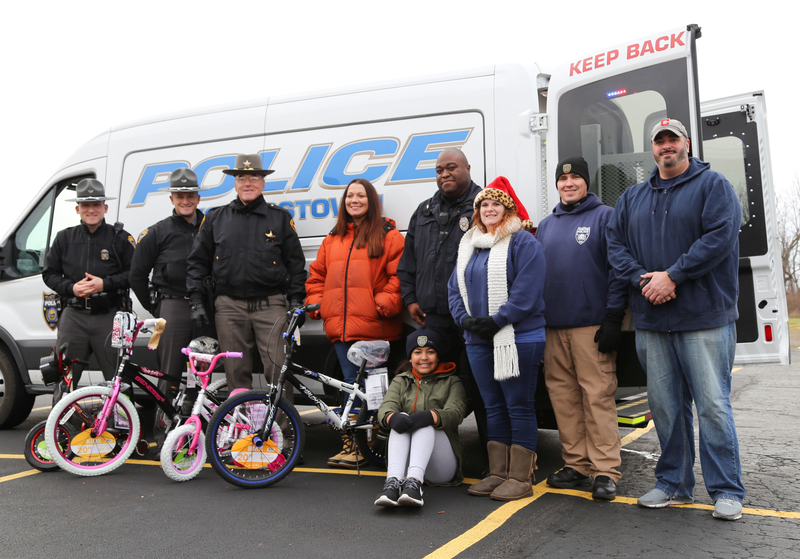 The Youngstown Police Department’s third annual Fill A Cruiser campaign Saturday collected hundreds of new toys that will eventually be distributed to children of needy families for Christmas. A prisoner-transport wagon, surrounded by regular patrol cruisers, was parked in the St. Christine Church parking lot, and by midafternoon, was crammed full of new toys. Officer George Wallace, who first organized the event three years ago, said the toys will be sorted, then distributed to families Dec. 23. The department is working this year with agencies such as Sojourner House to determine which families will be helped. The first year, the department collected enough toys to provide Christmas gifts for seven families, and last year’s event helped 22 families, Wallace said. There were still toys left over that were given to the Salvation Army for distribution. He said the number of families helped this year will depend on how many toys are collected. Wallace, 38, said the years he spent going into homes as part of the department’s Community Policing program revealed the need that so widely exists, and led him to create the gift giveaway program. Jo Gulfo, who lives on the city’s West Side, said she had similar experiences growing up. Georgette Doty of Canfield said she saw a story about the Fill A Cruiser campaign on the morning news Saturday and knew she had to help as well. “The Youngstown Police Department is near and dear to my heart,” she said. Her cousin, Michael Hartzell, was a city police officer who was shot and killed while on duty April 29, 2003. “What a loss,” Doty said. Doty and Gulfo both said they thought the project was a wonderful cause. Although the project is spearheaded by YPD, the Ohio State Highway Patrol and the Mahoning County Sheriff’s Office assisted with Saturday’s collection. Deputy Mike Vodilko of the Mahoning County Sheriff’s Office said it was an honor for him to take part. “It’s a great way for us all to give back to the community,” Wallace said. He added that the project will most likely happen again next year. December 9, 2018 12:08 a.m.
December 2, 2017 7:37 p.m.
December 23, 2016 12:08 a.m.
December 4, 2016 12:04 a.m.